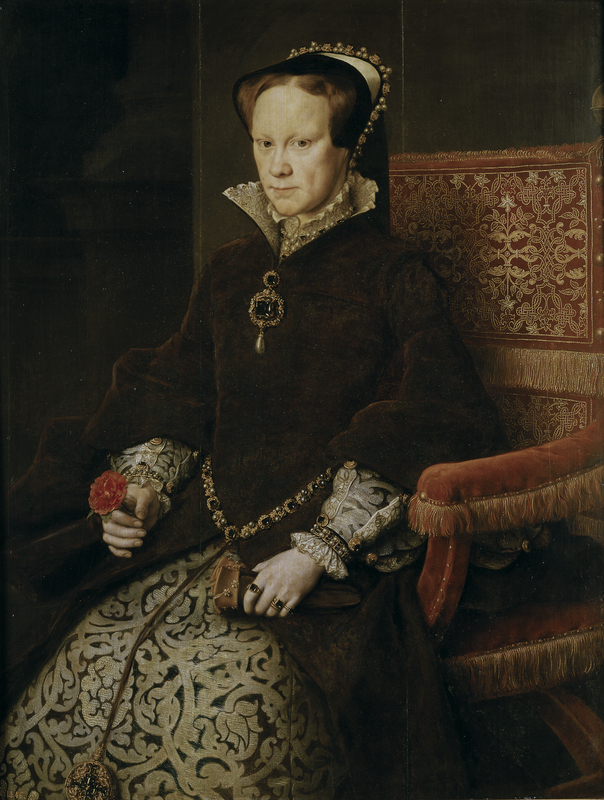 After years of not knowing what her future held at 3pm on 30th September 1553 Queen Mary I began her coronation procession from the Tower of London and made her way to Whitehall where she would stay overnight before being proclaimed Queen the next day. Mary and the procession left the Tower to the bells of churches ringing and gun fire. The procession consisted of the Queen’s messengers, trumpeters, heralds, bannerets, esquires of the body, Knights of the Bath which included 15 that had been newly created that morning, the clergy, merchants, soldiers, knights, foreign ambassadors and the council. Following all of these came Mary’s retinue that included the Earl of Sussex who was acting as Mary’s Chief Server, Stephen Gardiner and William Paulet carrying the seal and mace, the Lord Mayor of London carrying the gold sceptre, the Sergeant at Arms and the Earl of Arundel carrying the Queen’s sword there was also ‘two ancient knights with old-fashioned hats, powdered on their heads, disguised’ who represented the Dukes of Normandy and Guienne. Behind all of these came the new Queen in an open litter pulled by six horses in white trappings. It was reported that she was ‘richly apparelled with mantle and kirtle of cloth of gold’ with a gold tinsel cloth and jewelled crown on her head. Mary was escorted by the mother of Edward Courtenay and the wives of the Duke of Norfolk, Earl of Arundel and Sir William Paulet all on horseback. Behind them was a carriage carrying Mary’s younger sister, Princess Elizabeth and their former step mother, Anne of Cleves. The procession would travel a mile and a half across London and there was entertainment at every turn including; a civic pageantry at Temple Bar, verses sung in praise of the new queen at Cornhill and Cheap, Queen Mary was address at St Paul’s by the recorder of London and was presented with a purse containing 1000 marks of gold by the chamberlain and an oration in Latin and English was delivered by playwright John Heywood at the school in St Paul’s Churchyard and finally minstrels played at Ludgate. Mary reached Whitegate where she would prepare for her coronation the following day at Westminster Abbey. 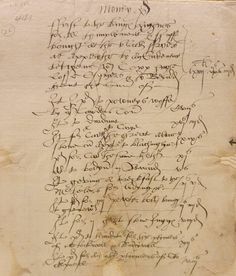 Thomas Cawarden was the son of William Cawarden, his birth is unrecorded but in 1528 he was noted as being an apprentice to Owen Hawkins, a mercer based in London. In 1542 Cawarden married, the only thing known about his wife is that her first name was Elizabeth, the couple had no known children. In 1540 Cawarden was appointed Keeper of Bletchingley manor. In the same year as marrying Elizabeth, Cawarden was also elected as a Member of Parliament for Bletchingley a position he would hold again in 1547. Bletchingley was so small it did not even hold the status of town. In 1544 Cawarden received a patent as Master of Revels and Tents, a position that was relatively minor until King Henry VIII when the role became important. Cawarden was the first to become head of an independent office and was also knighted in the same year at Boulogne. Soon after Cawarden was appointed the office and stores were moved to a dissolved Dominican monastery at Blackfriars. As part of his position he was responsible for overseeing royal festivities, progresses and military expeditions. In 1547 Cawarden and his office provided hales, roundhouses and a kitchen tent for a military expedition to Scotland during the war of the Rough Wooing. Upon the return home Cawarden paid for the tents to be dried and put away after they were soaked during travel. During the reign of Queen Mary I she ordered officers to collect arms and armour from Cawarden’s home in order to protect to city from Wyatt’s rebellion. Also during Mary’s reign Cawarden was implicated in a plot to replace Mary with Elizabeth. Evidence given implicated Cawarden and others in which he was allegedly require to intercept any treasure sent by Queen Mary to her husband in Spain. In May 1556 Cawarden was given a bond ordering him to remain in his home at Blackfriars, just two months later the order was rescinded. His patent also allowed Cawarden to keep 40 armed and liveried servants at Bletchingley Castle, during his time in office Cawarden lived at Loseley Park near Guildford, which is where his official papers were preserved. Many honours came to Cawarden in his life including in 1543 he was appointed as Keeper of the house and gardens of Nonsuch Palace until 1556, in 1547 Cawarden was appointed as High Sheriff of Surrey and Sussex, in 1550 as Keeper of Hampton Court and in 1558 he was the joint Lieutenant of the Tower of London, sharing the position with Sir Edward Warner. Between 1547 and 1559 he was elected as knight of the shire for Surrey on four occasions. In 1547 Cawarden obtained the former home of Anne of Cleves, Bletchingley a Tudor home that was gifted to the former Queen as part of her divorce settlement with King Henry VIII. In 1551 Cawarden began work on a banqueting house in Hyde Park, London with Lawrence Bradshaw who was a surveyor of works but by 1556 this was supplanted by his banqueting house at Nonsuch Park. 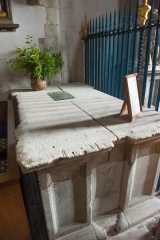 Cawarden died on 25th August 1559 at East Horsley, his body was taken to Bletchingley for burial. On the 28th July 1540 as his former Lord Privy Seal and Principal Secretary Thomas Cromwell was being executed King Henry VIII was marrying his fifth wife, Catherine Howard. 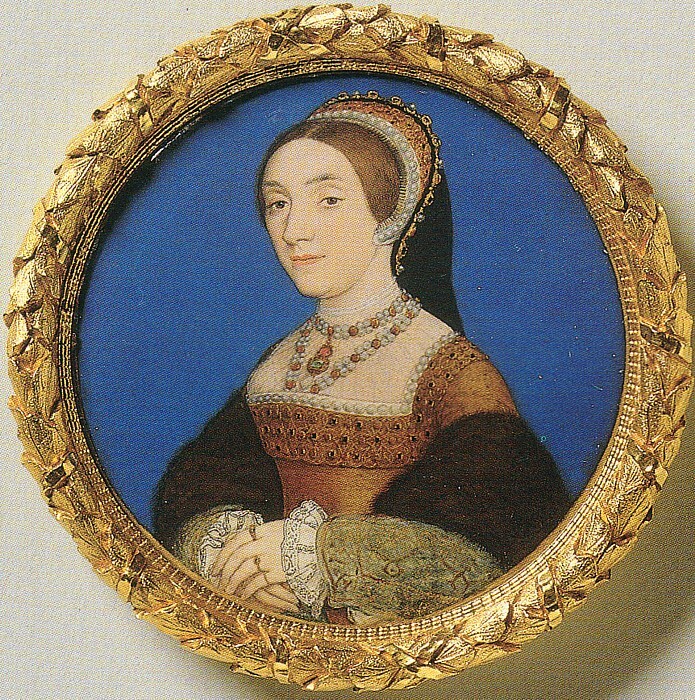 Catherine Howard was the maid of Henry’s fourth wife, Anne of Cleves and was approximately 20 years old when she married the aged King who was fast approaching 50. The couple were desperate to marry as Henry believed that his new bride to be was pregnant and Henry wanted any new children to be legitimate as although he had Prince Edward as well as the Ladies Mary and Elizabeth Henry still wished for another son. Henry knew all too well how important it was to have a second son, as he himself was not initially the heir to the throne until his elder brother Arthur died at the age of 15. Henry and Catherine married in a private ceremony at Oatlands Palace, Surrey and it was conducted by Bishop Bonner. 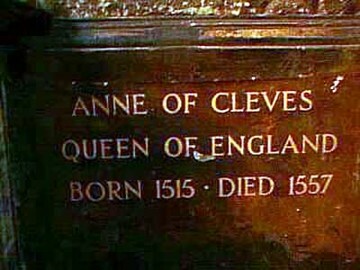 The marriage was days after Henry’s annulment to Anne of Cleves and this marriage was kept secret for ten days. Catherine appeared for the first time as Queen Consort on 8th August 1540 at Hampton Court Palace before the newlyweds headed to Windsor for a short honeymoon. 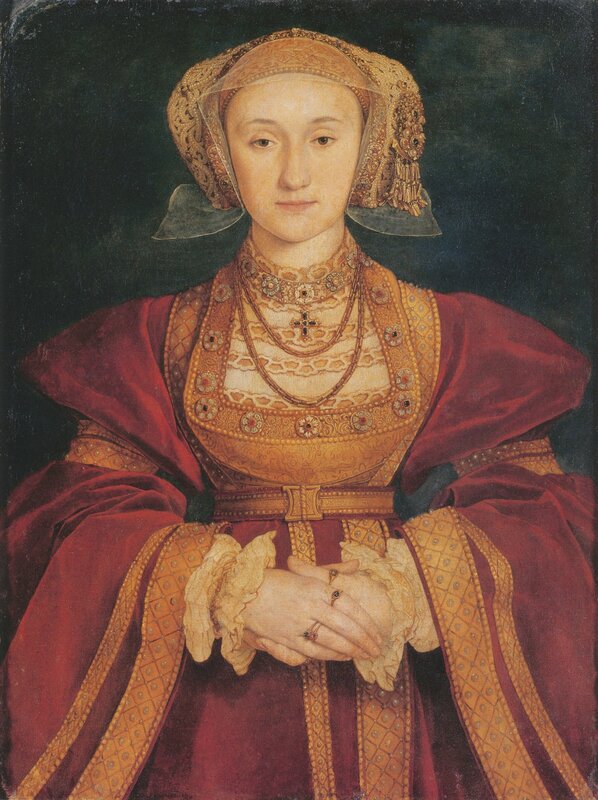 Henry’s marriage to Anne of Cleves was so expensive and expected to last the royal treasury was depleted and so there was no money available for Henry to give Catherine either a marriage feast or a coronation. However, just less than a year later the marriage was over after Henry had been informed that Catherine had been unfaithful and not only that she was not as innocent as believed as she had relationships with men before her marriage to the King. Henry was devasted that his new bride was not what she seemed and ordered her execution; she was beheaded at the Tower of London on 13th February 1542. On 30th June 1540 Thomas Cromwell wrote to King Henry VIII from the Tower of London, where he was being held prisoner, asking for mercy. Cromwell was being charged with treason and heresy but also Henry was dissatisfied with Cromwell over the disastrous marriage to Anne of Cleves, which Cromwell had arranged. 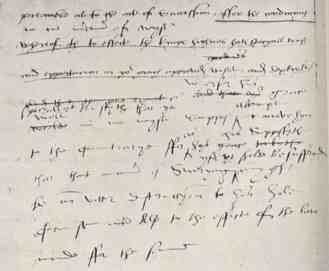 With this letter it was Cromwell’s last chance to appeal to Henry and save his life, however, the letter did not work and Cromwell would not get to speak to Henry again.